What is Horse-Human Heart Coupling? Research indicates we may not be as in sync with our horses as we thought. I heard the phrase ‘horse-human heart coupling’ recently. What is it? In an effort to explore that intangible, heart-felt, human-horse connection that all of us who have felt it know so well, researchers are using sophisticated heart monitoring devices to measure the synchronicity of horse and human heartbeats. Heart coupling investigates the correspondence of horse and human heart rate (HR), and heart rate variability (HRV), a measure of the changes in the intervals between consecutive heart beats, claiming to differentiate between physiological arousal due to exertion and psychological arousal due to anxiety. 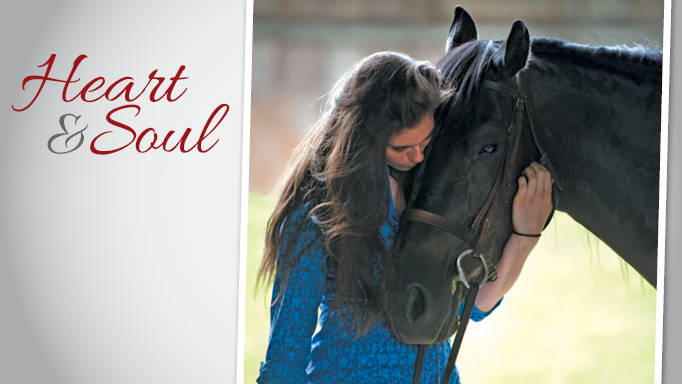 Heart coupling has been studied in varied contexts with the goal of determining the degree to which a human’s emotional state may influence the emotional state of their horse. Swedish researcher Linda Keeling found some support for this notion through monitoring HR in horses and humans while horses were led or ridden around several passes in an unfamiliar arena. HRs of both handlers and riders decreased on each successive pass, but rose significantly on the final pass, when they were told that researchers would momentarily be opening an umbrella (although no umbrella was actually opened). 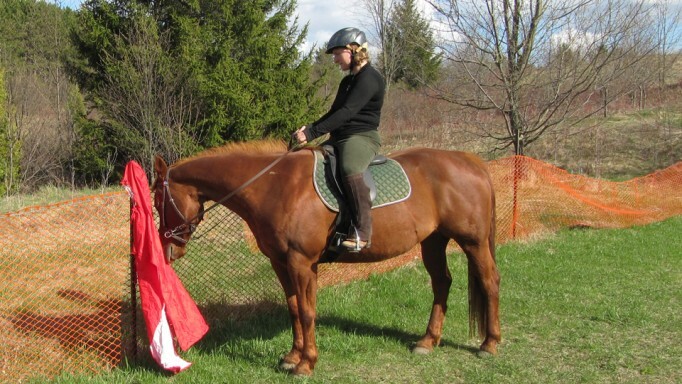 Interestingly, their horses (presumably not privy to the opening umbrella tip) also experienced this same rise in heart rate, suggesting that they sensed their human’s anxiety and became similarly aroused. Common wisdom would have it that not only do horses know when a person is nervous, but that they use this to their advantage. Katrina Merkies from the University of Guelph measured HR in both humans and horses while one horse was free to interact with a blindfolded human participant with 1) a normal HR; 2) an elevated HR due to exercise; or 3) an elevated HR due to fear (blindfolded and nervous of horses – where on earth did they find these volunteers?). Horses actually had lower HR and slower and calmer behaviours in the presence of an aroused person than they did in the presence of a calm person. These findings may offer some insight as to why horses seem to be such responsive therapists for Equine Facilitated Therapy programs. Yet another twist to this relationship was found by equine researcher Mareike von Lewinski and her group in Neustadt, Germany, who investigated HR coupling in high-performance riders and their advanced dressage horses at a public performance and an identical dress rehearsal without spectators. Researchers anticipated that both horses and riders would be influenced by the performance atmosphere present in both situations and that horse and human physiological responses (HR, HRV, and levels of the ‘stress hormone’ cortisol) would be closely correlated. However, whereas riders’ stress responses rose significantly from the private to the public performance, their horses’ responses did not. Physiological markers indicated that performance in general was stressful for horses, but the stress of performing for an audience was not additionally stressful. Unlike the looming opening umbrella study, these riders’ increased anxiety on show day was not transmitted to their horses. As my father, Lyman Henderson, so aptly put it, “In science, we don’t always measure what we want; rather, we measure what we can. And once having measured, we focus on what we measured.” Although we would like to measure this ethereal bond – even the term “heart coupling” captures this concept of connection – what we do measure is the correlation between a horse’s and a human’s heart rate as they are engaged in various activities. But, once having measured that, there is a tendency to interpret it as if it has more meaning than it really does. Where synchronicity does occur, we still face the “correlation does not equal causation” dilemma. Do nervous humans make horses nervous? Or do nervous horses make humans nervous? Or is there a third variable, such as all the factors that change at show time (travelling, demanding coaches, changes in housing, food, sleep patterns, etc. 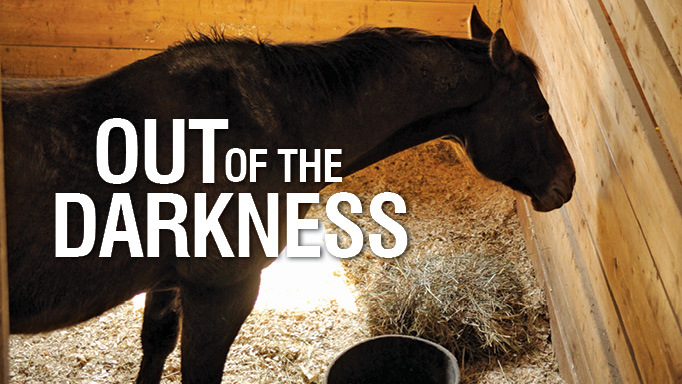 ), that drives the relationship of increased anxiety for both humans and horses? These are muddy waters still and clearly, there is more research to be done. 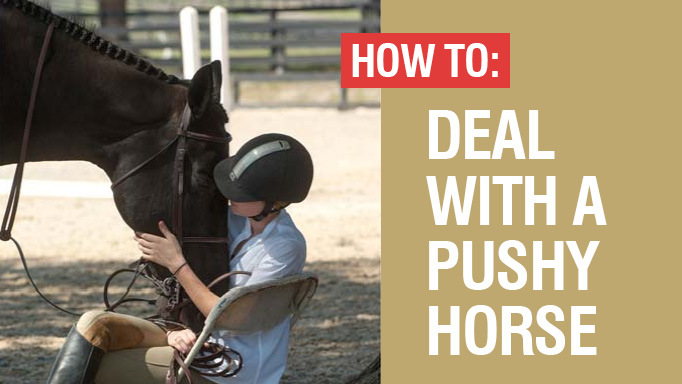 Horses that are pushy can be very frustrating and even dangerous to be around. 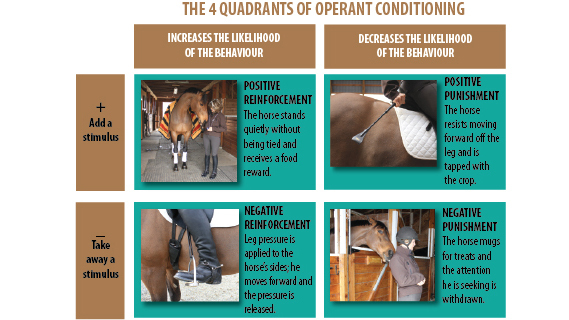 Positive Reinforcement: Where Does It Fit In Equine Training? Learn five strategies to help keep your horse focussed under saddle.